the Voice of an Imperfect Christian and her Kooky Ideas | V.I.C.K.I. I have been gradually increasing our family to include whole foods and decrease prepackaged goods for the past 5 years. I’ve studied holistic health and nutrition and have learned many things. Always a student is is my philosophy and I am always learning and wish to share with you what I’ve learned, past and present. In my quest for health I’ve had to be as frugal as I could as we are only on one income and are not debt-free yet with 4 hungry kids. I am not able to buy everything organic or get grassfed beef as I’d like to. We used to be blessed with raising chickens in a previous home but have not had the opportunity for a while. I sure do miss those yummy eggs! I do make almost everything from scratch including but not limited to macaroni and cheese, spaghetti sauce, anything baked and chicken stock. 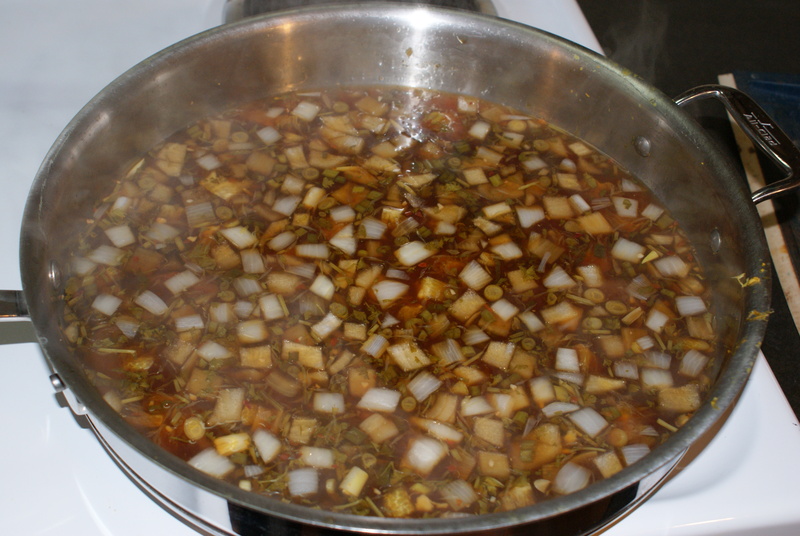 I use dry beans in our cooking as they are cheaper, have better flavor and no preservatives. With them I will also make refried beans and hummus, yum. My kids have always grown up with a diverse diet as I like to experiment with new recipes so I luckily don’t have to deal with picky eaters. For first aid and colds I utilize herbs, herbal teas and extracts as the first line of defense or offense. If it cannot be handled at home I will take us to the doctor or emergency department. Before staying at home I was an RN and do respect what science and medicine has contributed but feel strongly that it should be only as necessary. When You Have No Place To Go But Up! Let me just begin by saying that this last year has been a really hard one, both physically(with chronic pain and illness), mentally and emotionally. I’m an optimist at heart but even optimists have their low moments. I’m at a place in life right now that I am struggling as to what to do next. I’m wanting to do so much because I have some energy right now that I’m stalled as to which one to start. Of course my family is a priority and I’ve continued to homeschool throughout our challenges and will continue to do so. For a couple years now I’ve had this insane urge to blog and sadly have not kept with it but I also want to read more and do more sewing, knitting and crafts. I have to figure a way to find time for everything, right? Because Super-Mom is my middle name right? WRONG! My family knows I’m not super-mom and they still love me. So why do I still try to be her? Pride, I guess. That sinisterly big emotion that creeps up on me from time to time. Do you get it too? I just need to dig down deep and do what my body and time allows and let everything else happen when it can. I can do that, I think. As I’m surrounded by a computer, notebook and papers I look up, stretch my neck and wonder why the kids get summer breaks and I don’t. I’m sore from perusing over book lists, curriculum choices and excel spreadsheets so the natural thing to do was feel sorry for myself. Then I thought about doing year round school with the kids. I’m thinking “that will teach them!”. What a pity party I was having, geesh. Has this happened to you? Believe it or not, I actually do like to plan our children’s education(weird, huh). Planning, researching and scheduling comes naturally to me but every now and again I get caught up in myself and let it rain on my parade. I just need to back off for a while, maybe get some other projects done. Hmmm…what to start? 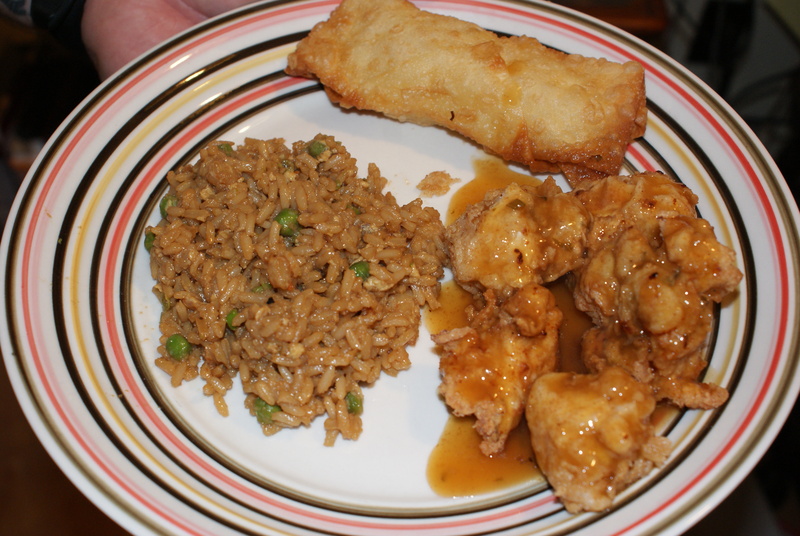 For my daughter’s birthday dinner it was requested that she have orange chicken, her favorite Chinese dish. So I went to scouring the internet for a healthy homemade version of orange chicken, fried rice and egg rolls. After a couple of minutes looking through different blogs, not finding exactly what I wanted, I went to my trusty All Recipes website. I love All Recipes….don’t you? 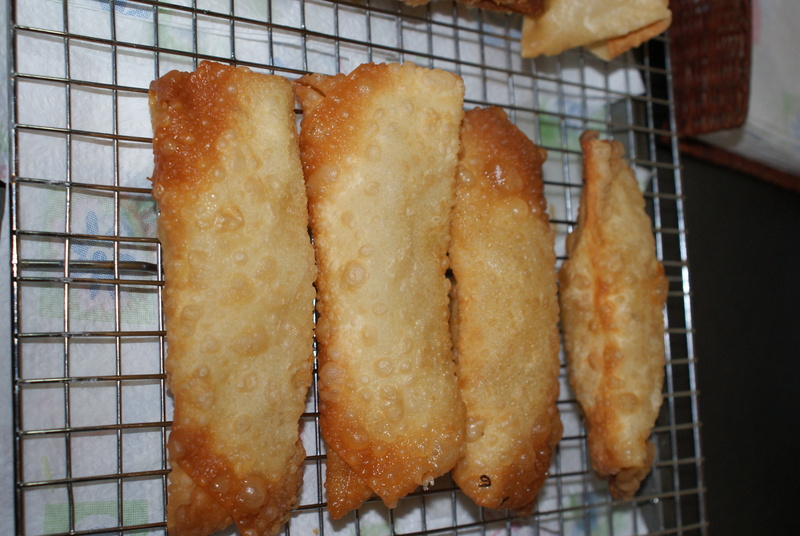 I had made the egg rolls before and already had it saved to my recipe box so I just needed to find the others. 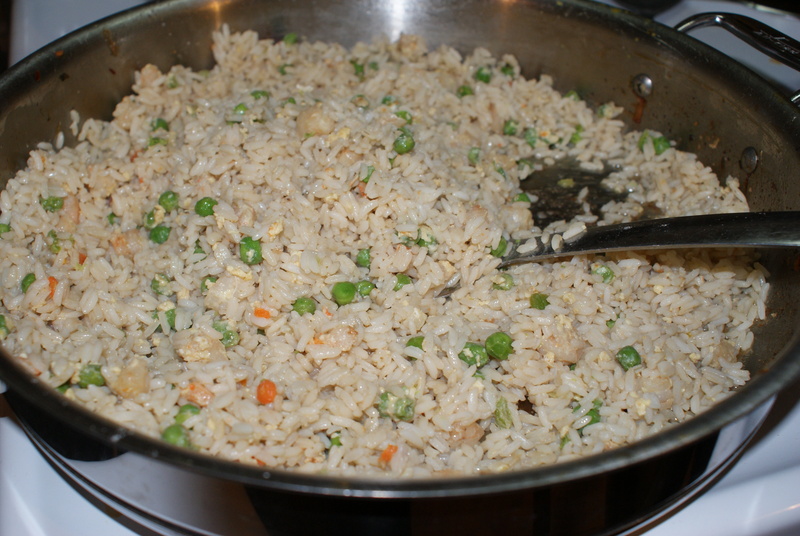 I started making the fried rice recipe, House Fried Rice when the chicken began to marinate. I eliminated the meats, just using shrimp and didn’t have any green pepper on hand. Leftovers is what I wanted , so I made a triple batch and when it was time to eat I re-fried the rice in sesame oil to make it more authentic and crispy, yum! So if you are in the mood for some Asian fare, go ahead and treat your family to some homemade orange chicken, fried rice and egg rolls! As I shared with you several months ago, I have just begun learning to knit. So what do you think my family received for Christmas this year? Hats! Yes, I have been a woman on a mission the past couple of months in order to complete my gift giving. And that is the reason I am giving for my absence on this blog, although there are many more excuses I could give. 😉 So I have made a total of 20 hats, 4 scarves and 1 pair of fingerless mittens. Whew! The thing that I wish I did was to take a picture of the projects before mailing them out. You know what they say about hind-sight, right? Well my vision is clearing up and I’m going to try harder to share each project with pictures. I'm just your average girl trying to live life to it's fullest who loves the Lord, being married to my husband and homeschooling our kids. I enjoy crafting of all kinds and attempt to do it often, although most days are spent teaching the kids or more likely, them teaching me. Mostly I write about what I've learned or are trying to learn regarding all aspects of my life. Enter your email address to follow V.I.C.K.I. and receive notifications of new posts by email.